Today's "On this Day" post honors the issuance of the 1st patent for sewing-machine inventor Isaac Singer. The post also asks whether the sewing machine brought women liberation or drudgery. I'd like to offer up my experience sewing as an example of the sewing machine providing an unexpected kind of liberation. When I am not lawyering, I'm dancing ballroom competitively. What started as an idea for a study break during law school has developed into a passion. While ballroom dance can be incredibly athletic, it is also an artistic endeavor combining music, movement -- and, of course, costumes! If you've seen any of the dance shows on television you already know they can be wild. They can also break the bank. Renting a dress costs a few hundred dollars for the day, and buying a new one runs a few thousand. I realized right away that if I was going to make this happen, I would have to learn to sew my own dresses. I bought my first sewing machine used in 2009 and have since discovered a new hobby-turned-passion: sewing. I like to sew because it's hard. I realized during my first project that I was actually scared to sew. I still am. Yet somehow, with each project, I summon the discipline to get over it and to think through the intricacies of the project. My mother, an engineer, is proud that I am finally paying attention to detail and doing calculations using π.
Sewing also forces me to calm down. When I'm rushing, or tying to work when I'm too tired, I make mistakes. And despite my best efforts to avoid them, it is a certainty that at some point during a project I will spend hours painstakingly ripping out seams. I've discovered within myself not only the ability to tolerate the mistakes, but a meditative quality to the process of fixing them. I never expected to find life lessons in my sewing room. Yet every time I sew, I find myself thinking: believe in yourself, slow down and focus, accept your mistakes. That's rare in my otherwise frenetic and competitive life. I can still hardly believe that I made the dress above, which I wore to compete in the U.S. National Dance Championships. 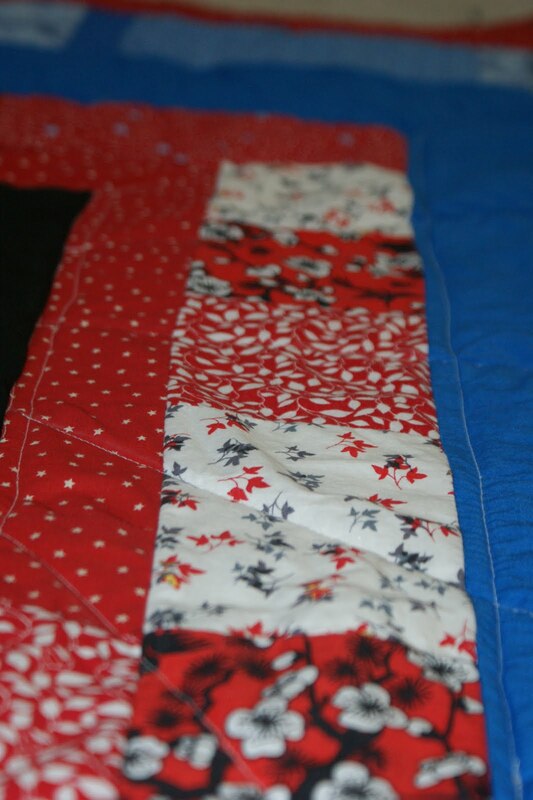 Or that I made the quilt at left for a friend's new baby. Encouraged by my sewing mentor, an extraordinary doll artist, Leslie Molen, I started a blog to talk about the process of learning to sew. Originally called "Boom Chiqui Boom," I've recently moved it to a new name and web address: Fruit Hat Fashions. Even if you don't sew, I invite you to join me there as I share what for me have been the wonderful benefits of the sewing machine.